The Global Volcanism Program has no activity reports for Ulreung. The Global Volcanism Program has no Weekly Reports available for Ulreung. The Global Volcanism Program has no Bulletin Reports available for Ulreung. Ulreung volcano, also known as Ullung, forms a small 10-km-wide island about 100 km east of the coast of the central Korean Peninsula. The high point on Ulreung-do (Ulreung Island) is 984-m-high Seonginbong Peak. The trachyandesitic Ulreung stratovolcano is truncated by the Nari caldera. Ulreung was the site of a major phonolitic explosive eruption at the beginning of the Holocene from Nari caldera that produced pyroclastic flows and deposited ash across the Sea of Japan (East Sea) in central Honshu. Lim C, Ikehara K, Toyoda K, 2008. Cryptotephra detection using high-resolution trace-element analysis of Holocene marine sediments, southwest Japan. Geochim Cosmochim Acta, 72: 5022-5036. Machida H, Arai F, 1983. Extensive ash falls in and around the Sea of Japan from large, late Quaternary eruptions. J. Volcanol. Geotherm. Res., 18: 151-164. Tomita T, 1969. Volcanic geology of the Cenozoic alkaline petrographic province of eastern Asia. In: Ogura T (ed) Geology and Mineral Resources of the Far East, Tokyo: Univ Tokyo Press, p 139-179. There is no Deformation History data available for Ulreung. There is no Emissions History data available for Ulreung. Ulreung volcano, also known as Ullung, forms a small 10-km-wide island in the Sea of Japan about 100 km east of the coast of the central Korean Peninsula. 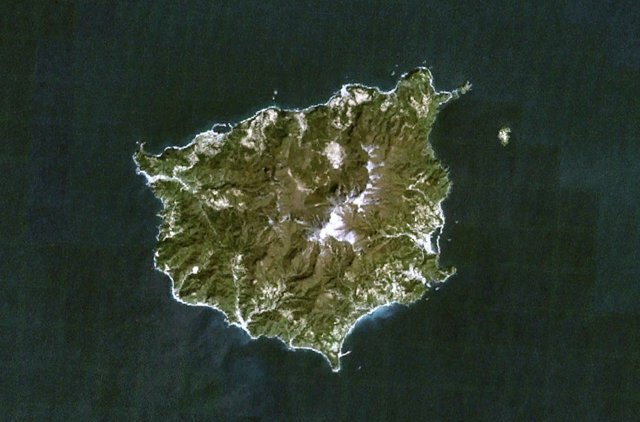 The island, seen in this NASA Landsat image (with north to the top) is a tourist destination from the Korean mainland. The 984-m-high stratovolcano is truncated by a caldera. Ulreung was the site of a major explosive eruption at the beginning of the Holocene that produced pyroclastic flows and deposited ash across the Sea of Japan in central Honshu. There are no samples for Ulreung in the Smithsonian's NMNH Department of Mineral Sciences Rock and Ore collection. Large Eruptions of Ulreung Information about large Quaternary eruptions (VEI >= 4) is cataloged in the Large Magnitude Explosive Volcanic Eruptions (LaMEVE) database of the Volcano Global Risk Identification and Analysis Project (VOGRIPA).